Thanks to Dr. Chungja C. Shim, Titusville Area Hospital, Pennsylvania (USA) for contributing this case. To contribute a Case of the Week, follow the guidelines on our Case of the Week page. (1) The Uterus chapter has now been updated, based on reviews by Mohamed Mokhtar Desouki, M.D., Ph.D. and Nat Pernick, M.D. 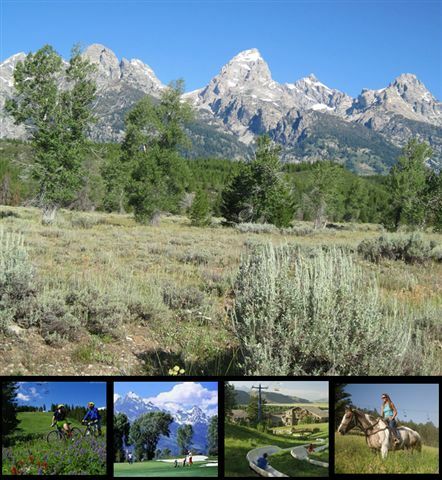 (2) We have a Special offer thru 4/30/2012 for our Jobs page. Post a Pathologist/PhD Job ad for the regular price of $800, and receive one FREE posting for a Job-Other ad (normally $500), if sent to us within 2 business days. A 45 year old woman presented with a large pelvic mass thought to be uterine. She was scheduled for a total hysterectomy with bilateral salpingo-oophorectomy. 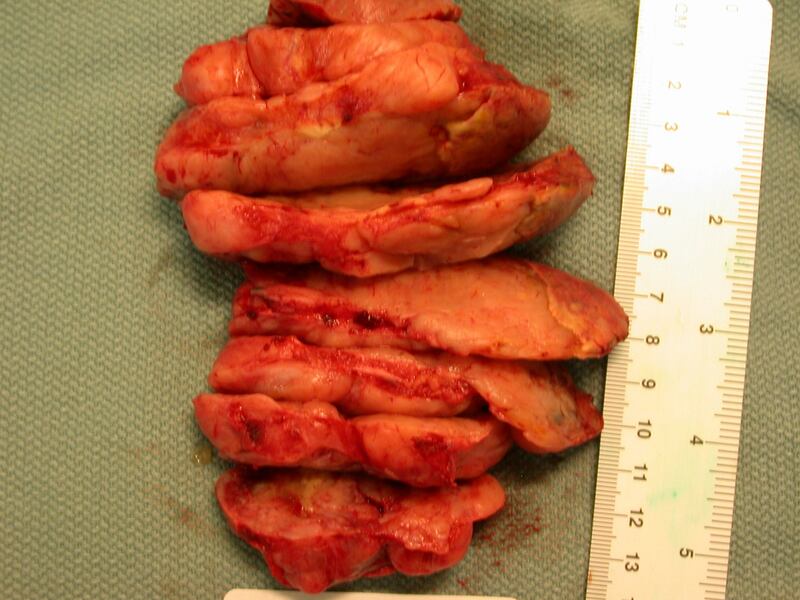 At surgery, the pelvic mass was attached to the mid-jejunum and adherent to the pelvic peritoneum behind the uterus. The entire mass was resected. The pelvic mass was 253 gm and measured 12 x 10 x 5.5 cm. It was solid with necrosis and hemorrhage on the cut surface. 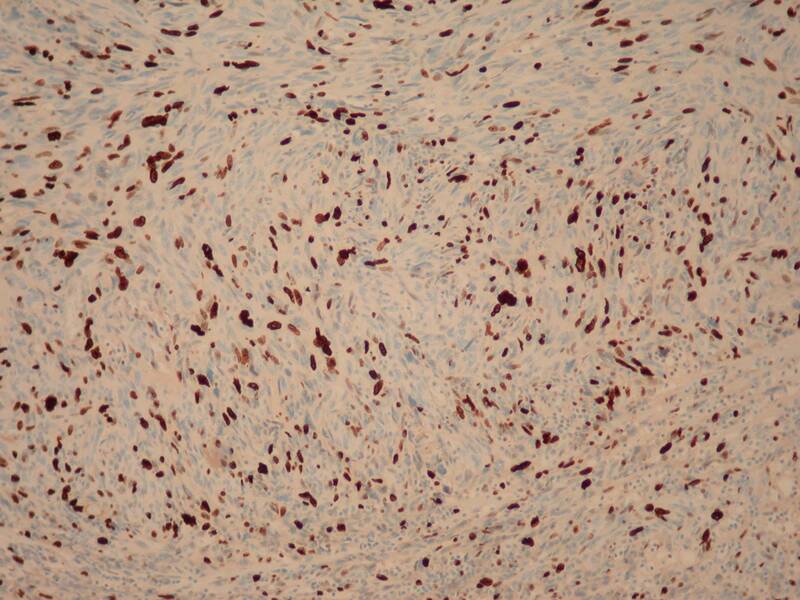 The tumor cells were negative for cytokeratin AE1/AE3, S100, SMA, desmin and CD68. 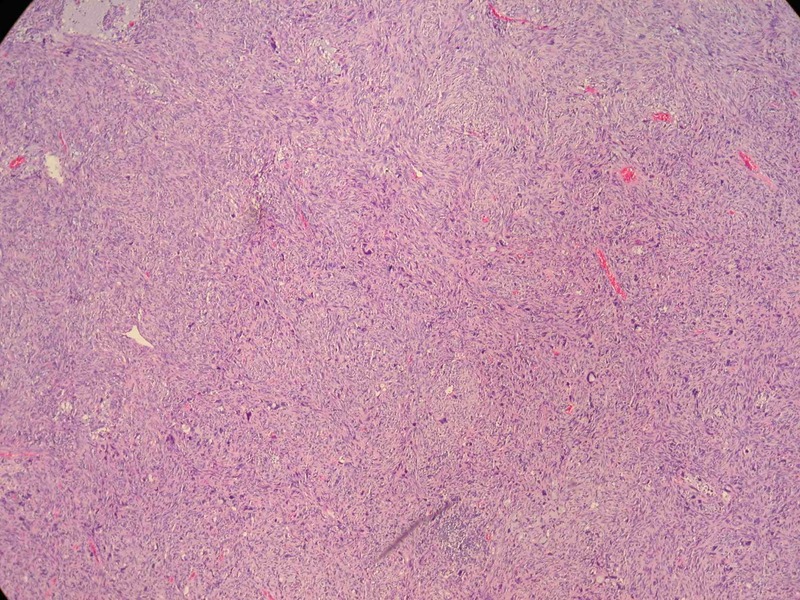 This tumor was a 12 cm mass adherent to the small bowel, with hemorrhage and necrosis. Morphologically, it was a high grade and pleomorphic spindle cell tumor. 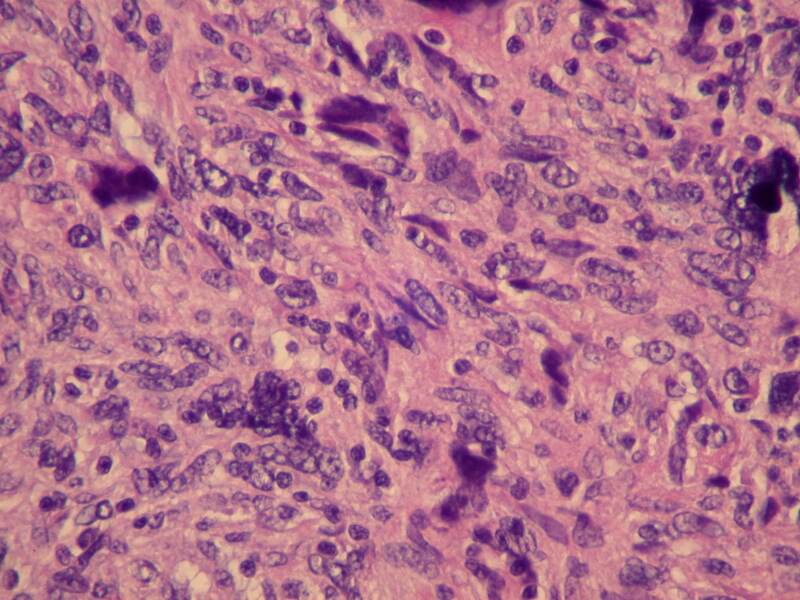 The differential diagnosis includes leiomyosarcoma, symplastic leiomyoma and fibromatosis. 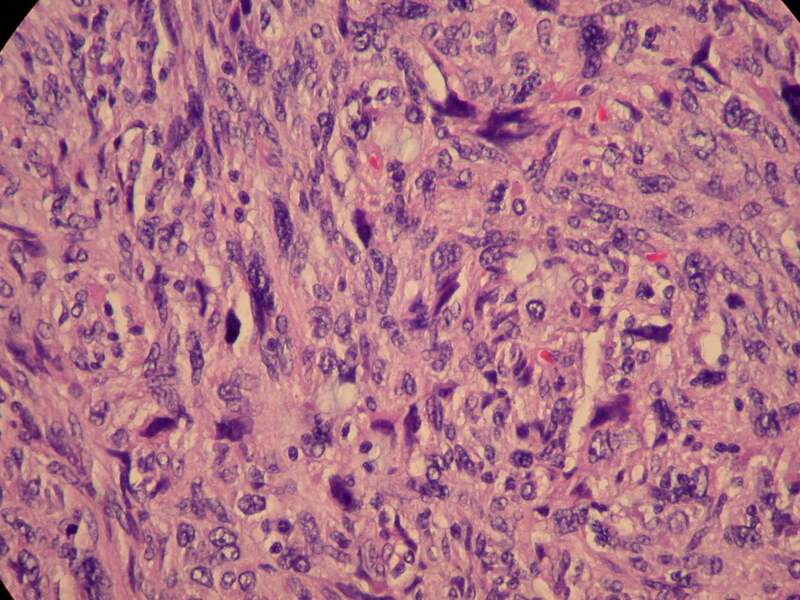 Leiomyosarcomas have smooth muscle morphology, although this may not be obvious in high grade cases. 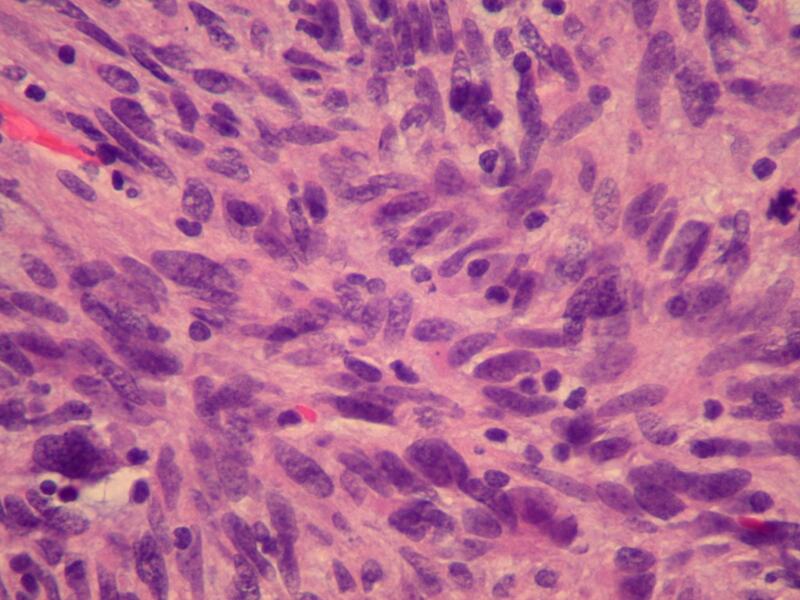 Symplastic leiomyoma contains bizarre multinucleated tumor cells that may look malignant, but there are usually areas resembling typical leiomyoma, and there is no hemorrhage or necrosis. 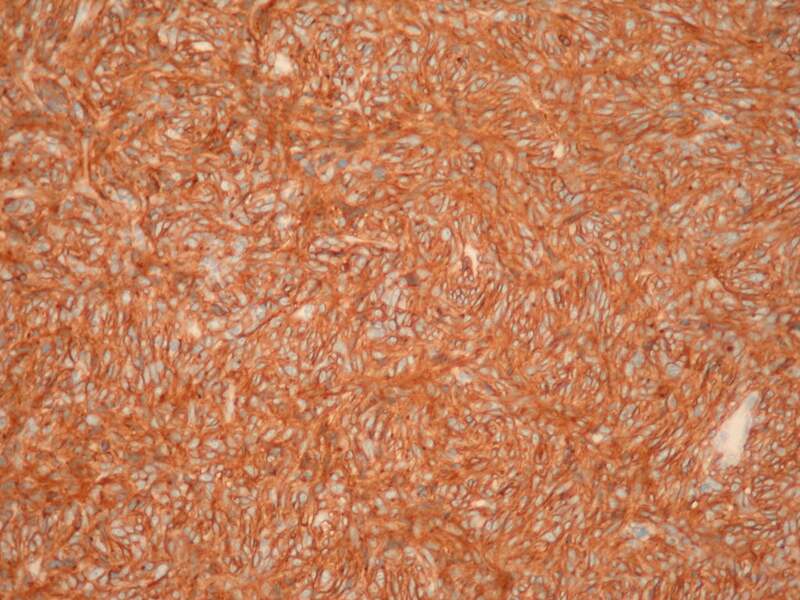 Both leiomyosarcomas and leiomyomas show some smooth muscle features by immunohistochemistry (smooth muscle actin or desmin positive), are negative for CD117 and CD34, and lack c-kit mutations. 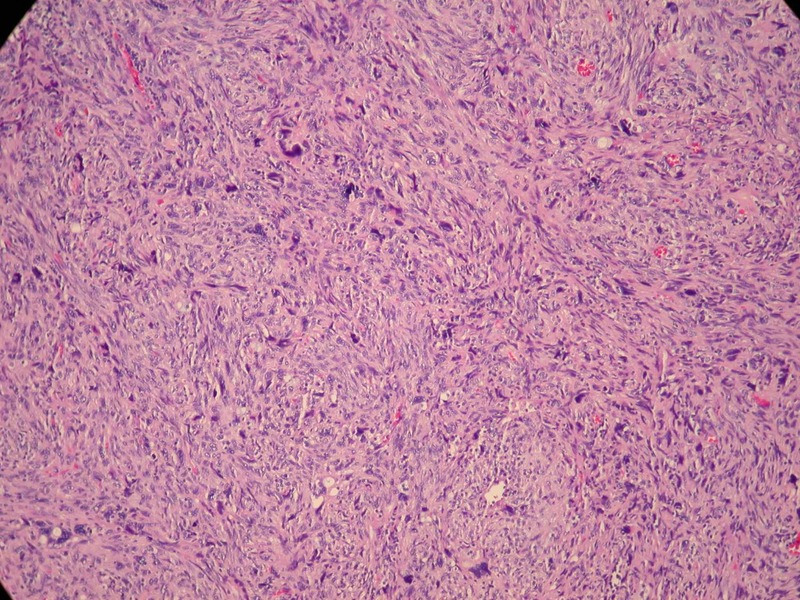 Intraabdominal fibromatosis has some overlapping features, but the morphology is different, with uniform cellularity composed of bipolar fibroblasts and myofibroblasts, and a background of distinct collagen with a mucopolysaccharide matrix containing thin walled, curvilinear or ectatic vessels. 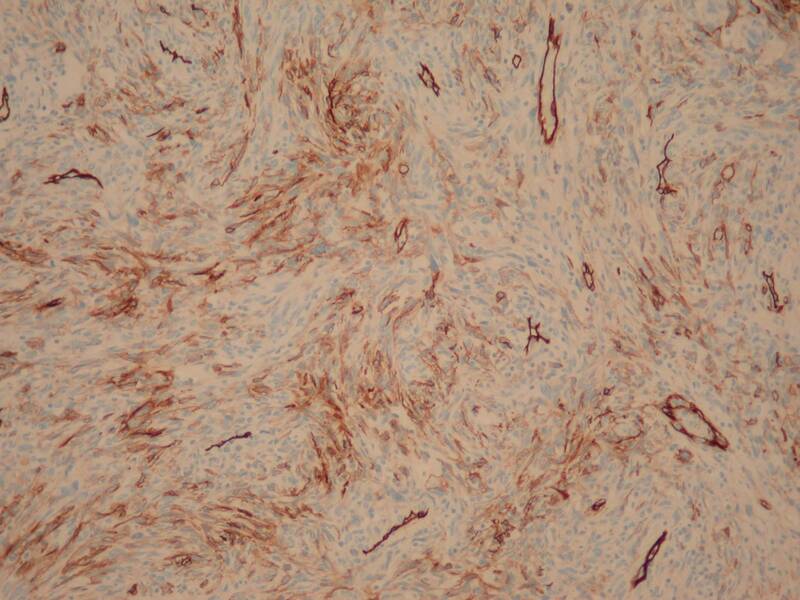 Fibromatosis has variable staining for smooth muscle actin and muscle specific actin, and may stain for CD117. However, the cells are negative for CD34 and have no c-kit mutations (Adv Anat Pathol 2007;14:178). Treatment of malignant GIST is typically surgical excision and tyrosine kinase inhibitors (J Natl Compr Canc Netw 2010;8 Suppl 2:S1). Prognosis is based on size and mitotic activity (Am J Surg Pathol 2006;30:477, table).